How should you choose a transport chair? 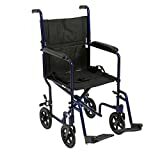 Transport chairs are compact, lightweight wheelchairs which can be easily folded and stowed away in your car for use outside the home. 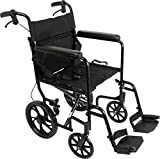 They are convenient to use and very durable--provided that you choose the best quality transport chair. 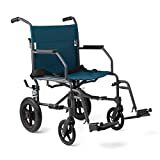 After going through thousands of transport chair reviews, we have listed some points which will help you buy the right one out of the multiple options available. 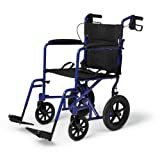 What should you consider before buying a transport chair? There are different types of transport chairs available on several e-commerce sites. But you need to consider several factors and read on-line reviews before deciding on buying one. Lightweight: Look for a lightweight chair which is easy to transport. Aluminum chairs, although expensive, are lighter than steel. Select an appropriate size: The average seat width ranges from 17” to 22”. Remember to could consult your therapist in this matter. Braking mechanism: Select a transport chair with efficient brakes. Obviously, the high-end models have more sophisticated brakes, but you should go through on-line reviews to get a better idea about the sensitivity of the brakes. Hand brakes: Opt for a chair with hand brakes, if you live in a hilly terrain. Features for a smoother ride: Look for a transport chair with large wheels for a smoother ride. Features for greater comfort: Look for a chair with a flip back or removable arms, which add to the comfort factor. 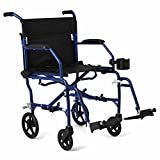 It can be a very handy feature, especially when you need to transfer a person with limited mobility. There are also transport chairs with removable legs of adjustable length. Also, special legs that swing outwards to allow a person to step down can add to overall comfort. 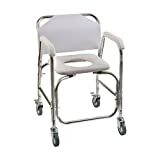 Rollator transport chair: Opt for a rollator transport chair. 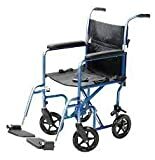 It is basically a walker which can be converted into a transport chair as and when such a need arises.